In September, the district told families the main bus contractor's staffing issues would be cleared up by October, but that proved wrong. The shortage has caused daily, hourslong delays since the start of school. The Seattle School Board voted Wednesday evening to extend an emergency contract that provides additional school-bus service until the district’s main contractor, First Student, can resolve a bus driver shortage that has dragged on for months and has caused daily, hourslong delays since the start of school. The new contract authorizes spending up to $1.4 million, for which the district hopes to be reimbursed. This amount is in addition to the nearly $30 million a year that the district pays to First Student for its bus services. “I double-dog, triple-dog dare any of my colleagues to speak against this motion,” Board President Leslie Harris said. Board members’ approval allows the district to continue receiving supplementary transportation services from Durham School Services, which is currently providing 15 more bus drivers and buses. The emergency contract authorized in late October was valid only through the middle of this month. Just before the vote on Wednesday, Deputy Superintendent Stephen Nielsen told board members that First Student believes it will have filled its open driver jobs by the end of January. In September, the district told families that First Student’s staffing issues would be cleared up by early October, but that projection proved to be wrong — even after the company authorized a higher hourly salary and hiring bonuses for its workers. First Student did not immediately respond to a request for an update on how many drivers it has. At the end of September, the company was 30 drivers short with 40 prospective employees in various stages of the monthlong application process. Seattle Public Schools and First Student officials have said the bus-driver shortage is a national problem that’s particularly acute in Seattle, where the unemployment rate is low. Earlier this year, the district also began contracting with American Logistics Company for supplementary service help on its routes for students receiving special education services. 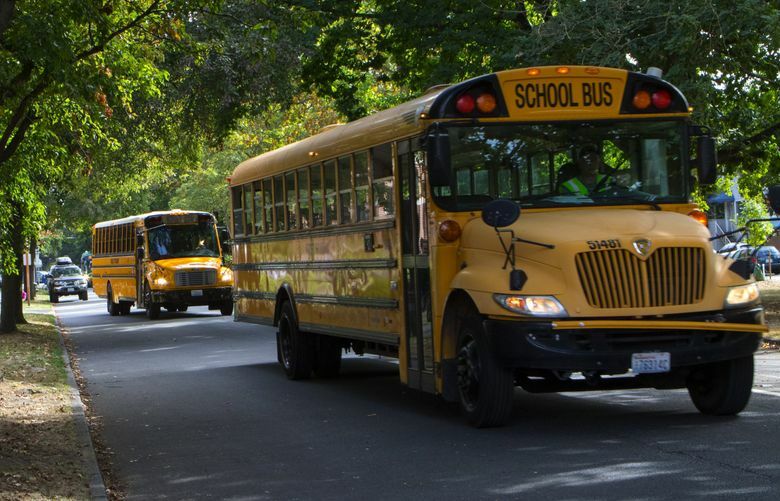 In a letter recently sent to the families of special-education students, the district promised compensatory education for missed services caused by bus delays, plus reimbursement for families’ driving students to school. The extra buses are making a difference, some parents say. They came as a welcome reprieve for Thurgood Marshall Elementary School parent Shine Sun, who said his 10-year-old daughter’s bus, now serviced by Durham, is more punctual than it has ever been in the past two years. But like other parents, Sun remains frustrated with what he calls the district’s spotty communication about late buses — phone alerts that come late or not at all. He said he and other parents in his neighborhood had been diligent about calling the district every day in the fall, but never got any feedback about whether Seattle Public Schools considered their concerns at all. Online, parents have organized a Facebook discussion group (Seattle Public Schools Parents Forum for School Bus Problems) to track the district’s transportation issues, exchange tips for getting the district’s attention, and share horror stories from the past couple of years. “When it comes to accountability and training, the district just hands it off [to First Student],” said Elin Björling, the group’s moderator and a research scientist for the University of Washington’s Department of Human Centered Design and Engineering. The bus issues no longer affect her two kids, but she still has questions for the district.